Hundreds of striking FairPoint Communications workers marched from a rally in Monument Square to FairPoint offices on Forest Avenue in November 2014. 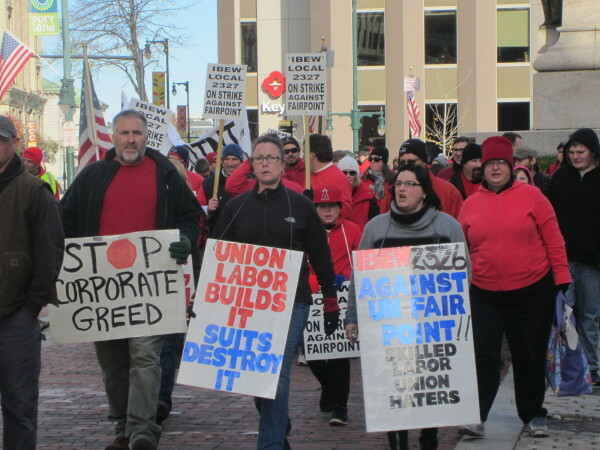 PORTLAND, Maine — The still unresolved FairPoint Communications strike now in federal mediation was the largest and most prolonged work stoppage in the country last year. The U.S. Bureau of Labor Statistics reported Wednesday the strike was one of 11 work stoppages involving more than 1,000 workers in 2014. In its 118th day Thursday, the FairPoint strike stands out. The next-largest strike started in 2014 lasted 32 days. Gary Chaison, author of “Unions in America” and professor at Clark University’s Graduate School of Management in Worcester, Massachusetts, said the FairPoint strike stands out in a year and period of history when strikes are fewer and further between. The strike, called by unions representing FairPoint workers in Maine, New Hampshire and Vermont, accounted for 86,700 idle workdays affecting 1,700 employees. A nearly monthlong strike at Zodiac Seats in Gainesville, Texas, was the second-highest by idle work days last year at 29,900. The FairPoint strike accounted for more than 40 percent of the 200,000 idle workdays caused by all major work stoppages in the country last year. Those stoppages involved about 34,000 workers. And even if the parties resolved the strike that started Oct. 17 by year’s end, it still would have been 2014’s longest. While raising questions about how to assess the duration of the FairPoint strike, Chaison said it does make a clear a recent trend in collective bargaining. “If anything, it encompasses many of the issues that we see in strikes nowadays, and that is the attempts of employers to use collective bargaining to cut employees’ wages and benefits,” Chaison said. The unions and company have been at odds over cuts to core benefits, such as health care and pensions, and also over expectations about changing technology that Chaison said presents a concern specific to the telecommunications industry. “In many ways, the parties are negotiating out of fear over what the next new technology will be and whether their jobs will be threatened,” Chaison said. A central issue in negotiations has been whether the company would be able to hire outside contractors to work on new telecommunications technology. FairPoint officials said the change was necessary for them to adapt to the quick pace of new technologies, but the unions saw that as opening the door to a divided workplace that would gradually phase out the work of union employees. Since mediation began Jan. 4, the company and unions have agreed not to speak publicly or to the media about the strike or ongoing negotiations. Historically, 2014 had the second-lowest number of federally reported strikes — tying 2010 and higher than 2009 — since the bureau began tracking major work stoppages in 1947, a year when there were 270 major strikes. The number of strikes peaked in 1952, with 470 strikes involving about 2.7 million workers and resulting in 48.8 million idle work days. Since the 1980s, that number has fallen to the low double-digits, staying below or around 20 for about the last decade. Michael Hillard, an economist and labor historian who teaches at the University of Southern Maine, said that started with the fight between President Ronald Reagan and the Professional Air Traffic Controllers Organization in 1981. “When Reagan fired and permanently replaced those air traffic controllers, everyone followed their lead,” Hillard said. That included International Paper, he said, which hired replacement workers during a 16-week strike started in 1986 at various paper mills, including its mill in Jay, which was memorialized in the State House labor mural, which was removed in 2011 by Gov. Paul LePage. FairPoint Communications has hired temporary replacement workers to keep the company operating during the strike but has not stated an intention to make those replacements permanent. Hanson said the condition of the broader economy has made strikes less common in recent years and at the same time has put pressure on wages and benefits. So far this year, other strikes have started at 11 oil refineries, involving about 5,200 workers, and port workers in Los Angeles decided to strike through the weekend. Chaison said he sees those strikes and the duration of the FairPoint strike as possible signals that workers are fed up with years of pressure since the recession. He said he sees it as an indication of global economic pressure that the longest strike of 2014 was in telecommunications and not manufacturing. It’s not yet clear just how the strike has affected the North Carolina-based FairPoint’s profits. The publicly traded company is expected to report in March its earnings for the last three months of 2014. Service quality for its landlines has dropped since the start of the strike. About 90 percent of service calls in November and December were not resolved within a day, according to a fourth-quarter service quality report filed with the Maine Public Utilities Commission. The report was the first account of service complaints since the onset of the work stoppage, though the company failed to log major outages during that period. State regulators are still considering whether to assess any penalties against the company for its third-quarter service report and will make the same evaluation for its fourth quarter report.